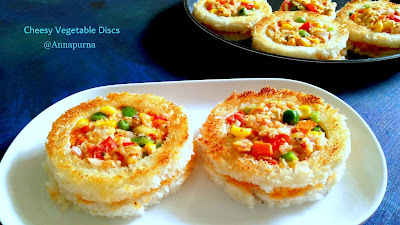 Vegetable stuffed buns are delicious appetisers where soft buns are stuffed with spicy veggie filling . 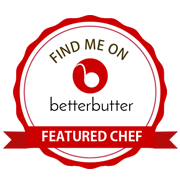 These homemade stuffed buns are healthy , wholesome and loaded with fresh vegetables. Best part is that the buns are egg less and made with 100 % whole wheat flour. Soft , fluffy vegetable stuffed buns topped with sesame seeds make up for a perfect party starter. 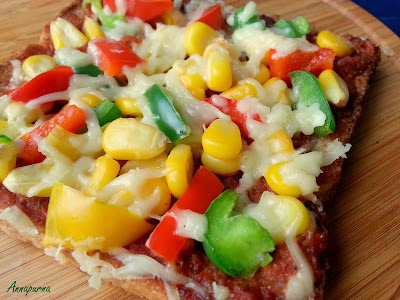 These can be made ahead of time and served as filling breakfast or packed into kids lunch boxes or served at any time of the day as snack with your favourite drink. I love to have them at tea time with my Masala Chai. The stuffed buns taste great on their own but you may serve them with ketchup or mayonnaise and some salad if you wish. My son is enjoying his term break and vacations for kids means a lot of play dates accompanied with yummy snack and refreshing drinks. These whole wheat vegetable stuffed buns are perfect picnic snack and for a game-day as well. 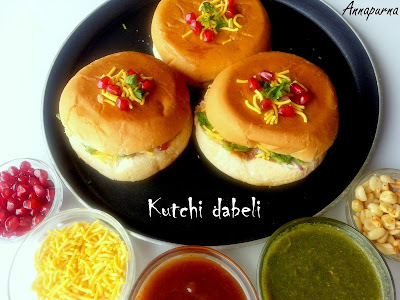 We enjoyed these delicious buns with tea while watching IPL Cricket match on television. 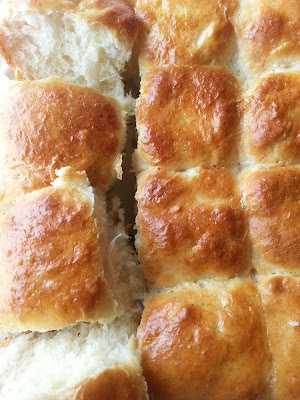 I must admit that these buns are super addictive and my first batch vanished the same day. 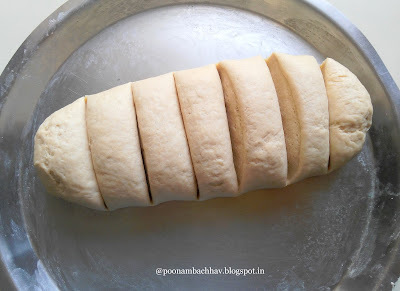 My first experiment of homemade bun was 3 years back . I made Egg-less ladi paav using refined flour. 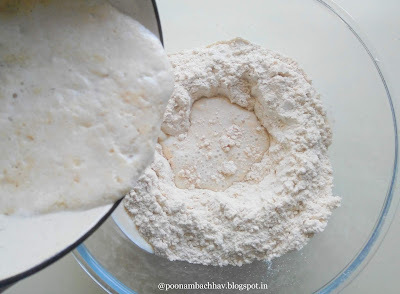 But from last 2 years I have stopped buying refined flour and all my bakes are with whole wheat flour. This time too the buns turned out soft and fluffy, not as much as they do with refined flour, but considering the health factor, i am pretty happy with the results. 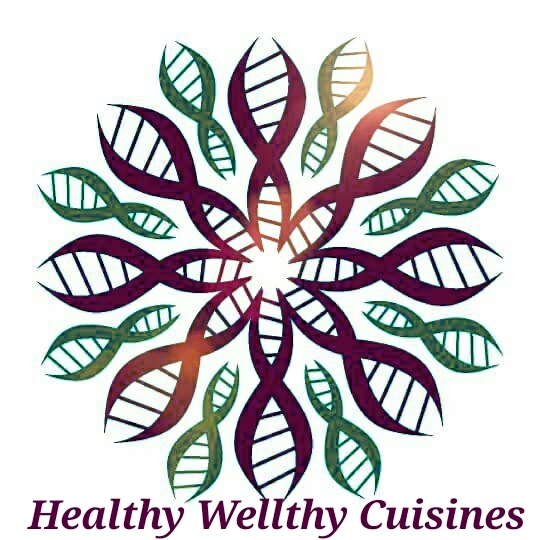 You may use refined flour and whole wheat flour in 1:1 ratio if you wish. I have made these buns in my Microwave oven with Convection mode. In a bowl take 1/2 cup lukewarm milk. Add sugar and dry yeast to it. Stir well and keep aside for 10 minutes for the yeast to bloom. 2. After 10 minutes, the mixture will turn frothy. If your mixture does not turn frothy it means the yeast you are using is old and of no use. 3. 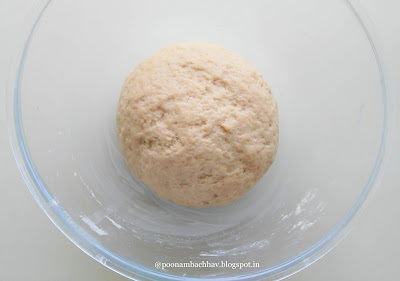 In a mixing bowl take whole wheat flour. Add salt and olive oil to it and mix well. Make a well into the flour and add the bloomed yeast culture into it. 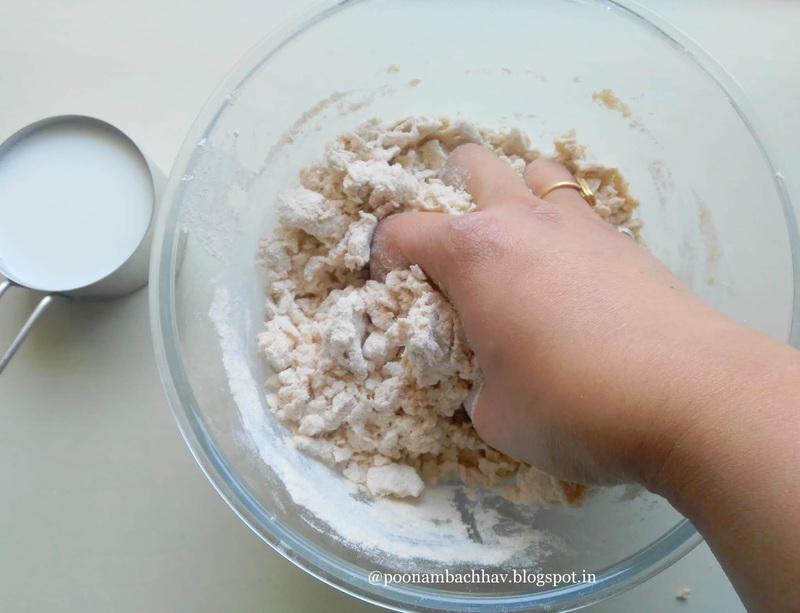 Mix well and knead the flour . Add up to 3/4 cup warm milk and knead the flour to a soft dough. 4. 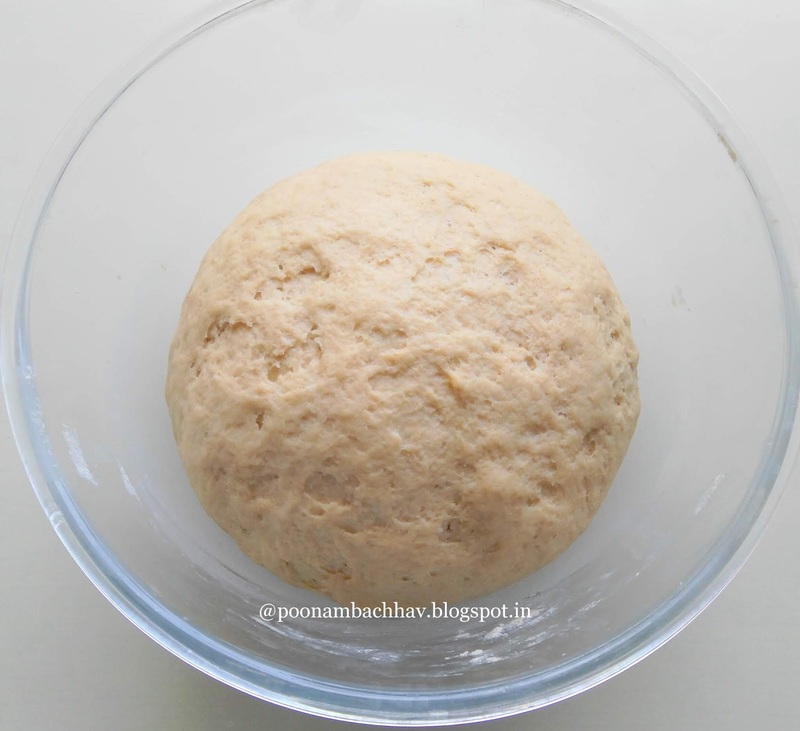 Take out the dough on to a working surface and knead for another 5 minutes. 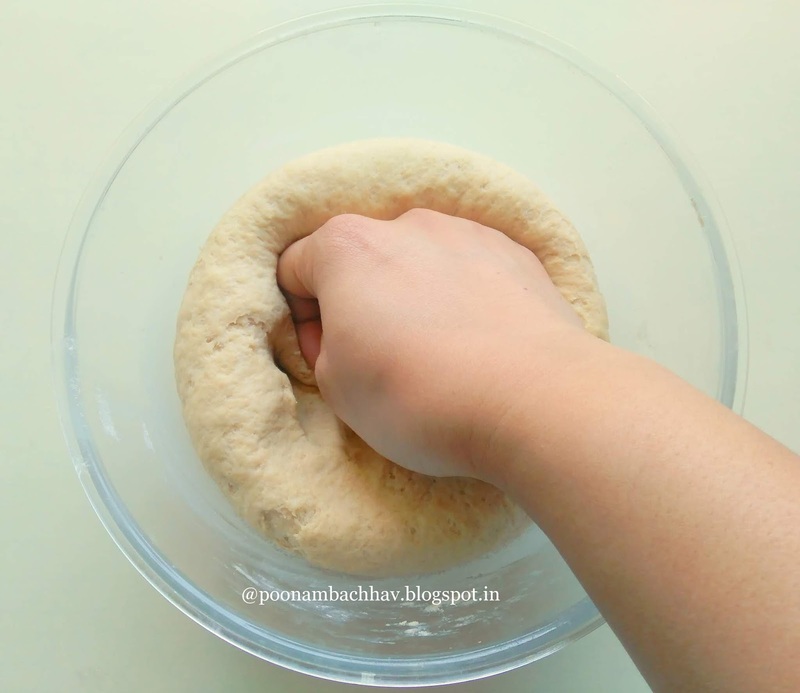 Tug the dough and keep it in a greased bowl . Cover it with another bowl and keep for proofing for about an hour. 5. Meanwhile we can prepare the vegetable stuffing. For that heat oil in a pan. 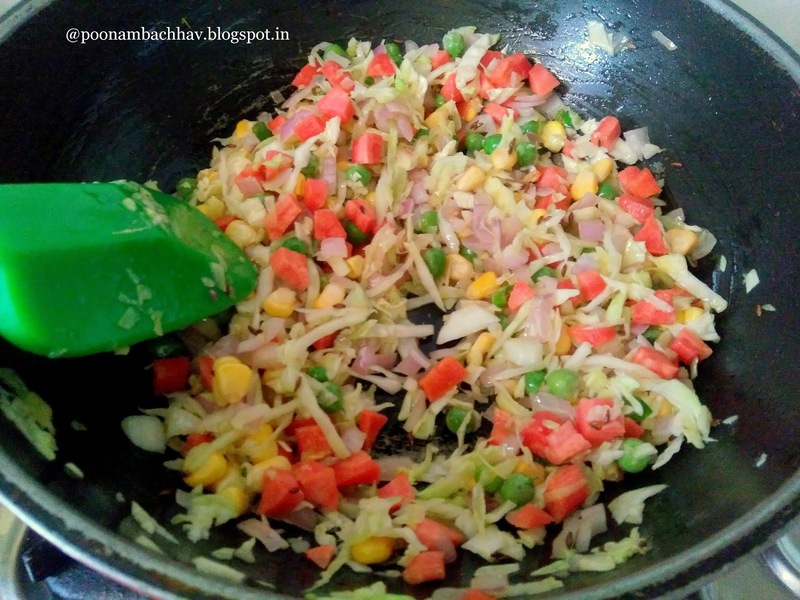 Add minced garlic and chopped green chilies to it. Fry for few seconds. Now add the onions and saute for half a minute. Next add all the vegetables, (cabbage, carrot, green peas, sweet corn) and stir fry for 2-3 minutes. 6. Next add the spice powders, (turmeric powder, red chili powder, garam masala, and chaat masala) . 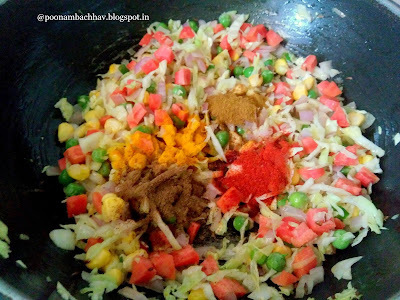 Mix ever thing very well and cook the veggies for another 1-2 minutes. 7. lastly add the salt , sugar and lemon juice, give a quick mix and put off the flame. Our delicious filling for the bun is ready. Allow it to cool down. 8. After and hour, the dough will be double in size. Punch it and knead again for 2-3 minutes. Now make equal portions of the dough by first shaping it like a log and then cutting with knife. 9. Roll each portion into a dough ball and place it over a greased baking tray. I could make 7 dough balls from the above mentioned quantity of ingredients. Keep the dough balls in a dark place for 10 minutes. 10. 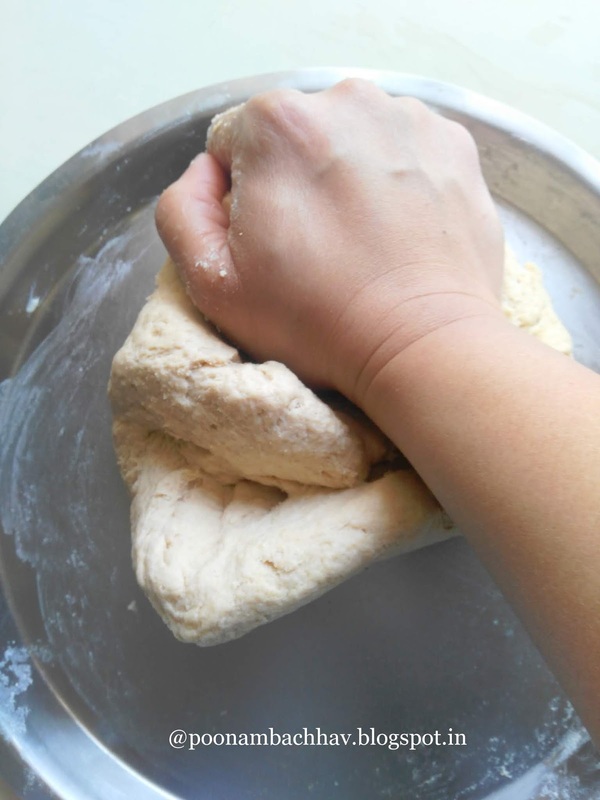 After 10 minutes, take each dough ball and flatten it on your palm by pulling and stretching the edges. 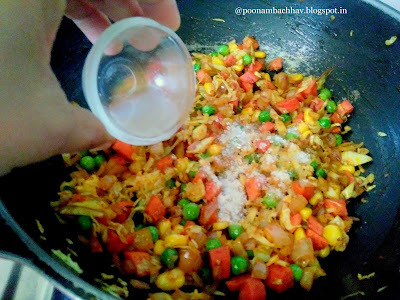 Now place about 1-2 tablespoon of our prepared vegetable stuffing over it. Gather the sides and seal them . Roll the ball lightly between palms and place on the baking tray. Stuff all the dough balls similarly. 11. Sprinkle black and white sesame seeds over the stuffed buns and keep the baking tray in dark place for 15 minutes. Meanwhile preheat the oven at 200 degrees Celsius for 5 minutes. 12. After 15 minutes the stuffed bun balls will increase in size. Brush them delicately with milk so that they do not dry out while baking. 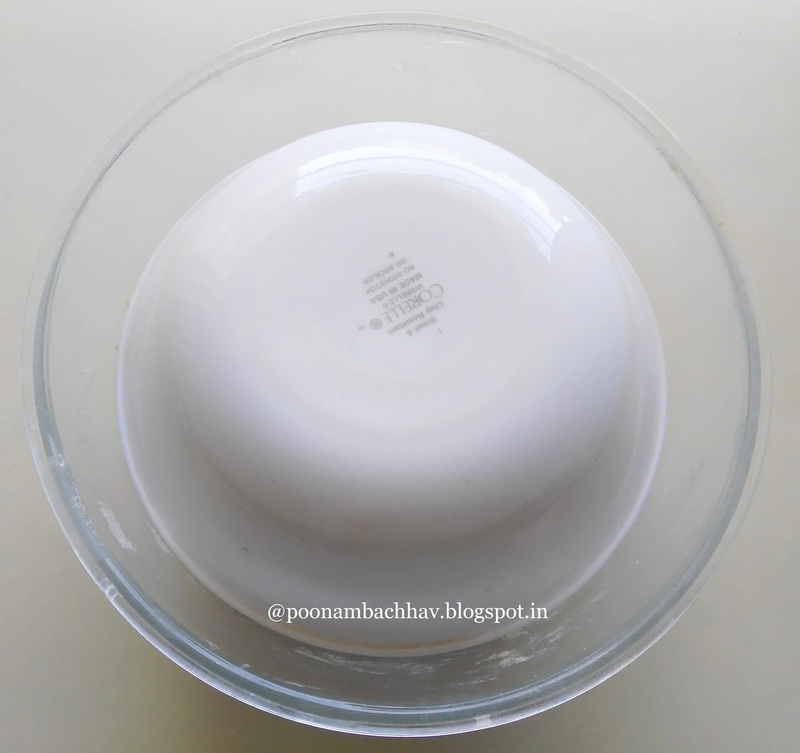 Place the tray in the preheated oven and bake for 20 minutes at 200 degrees Celsius. 13. Once done, apply butter on the buns and keep them covered in kitchen towel. 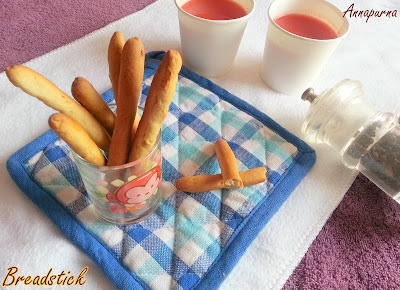 Serve them as starter or appetisers at a party or simply as tea time snack. The stuffed buns taste great on their own but you may serve them with ketchup or mayonnaise and some salad if you wish. You can add potato stir fry or paneer or any other vegetable like mushrooms as the filling for the bun. 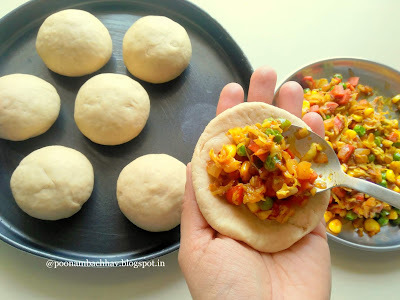 Left over stir fries also work well, just make sure the curry you use is dry and can be stuffed easily in the bun balls.Vegetables can be substituted with chicken or minced meat for non-vegetarian version . 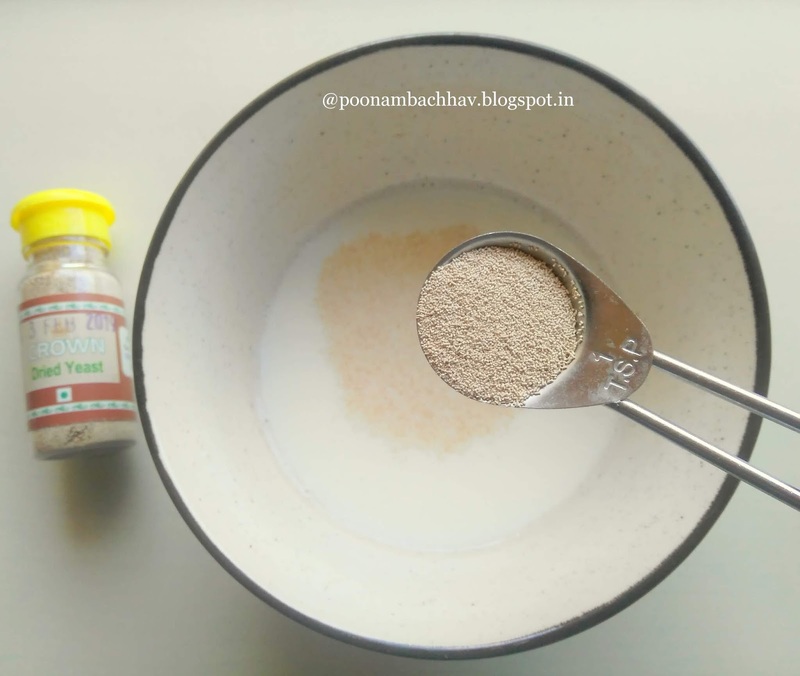 If the dry yeast does not bloom and your milk does not turn frothy, do not use it. It means the yeast you are using is old and needs to be discarded. Discard it and make a fresh culture with new batch of yeast. 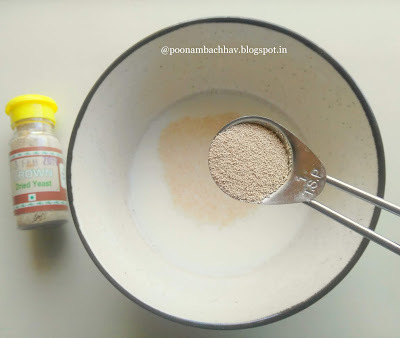 Another important factor to be kept in mind while using dry yeast is the temperature of the milk. Always add the dry yeast to the lukewarm milk. If the milk is hot it will kill the yeast culture. If it is cool, the yeast will not bloom either. 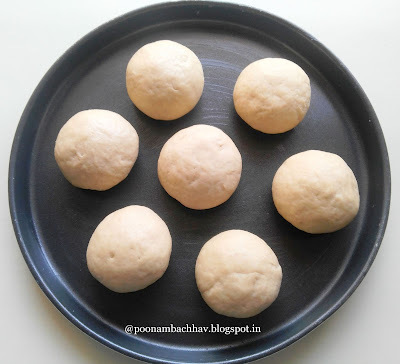 Do not skip the brushing of the buns balls with milk prior to baking as it not only helps the buns to remain soft and prevent them from drying out during baking, but also help in getting the golden brown color of the buns. 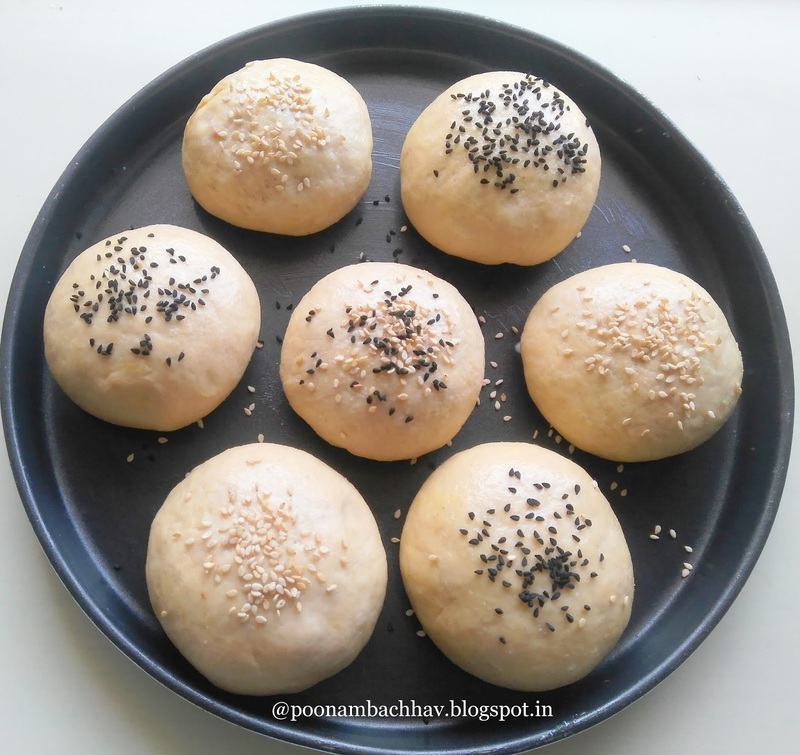 Linking these delicious whole wheat vegetable stuffed buns to the #StuffedBreadMelaAtHW. The theme is suggested by Swaty Malik . Following are the contributions of my fellow bloggers towards this theme. Potato Stuffed Bajra Paratha , Paneer Cheese Stuffed Paratha, Stuffed Curry Buns, Baked Stuffed Kulcha, Bhaji Stuffed Buns. Poonam I am drooling over these buns pics..beautifully shot. 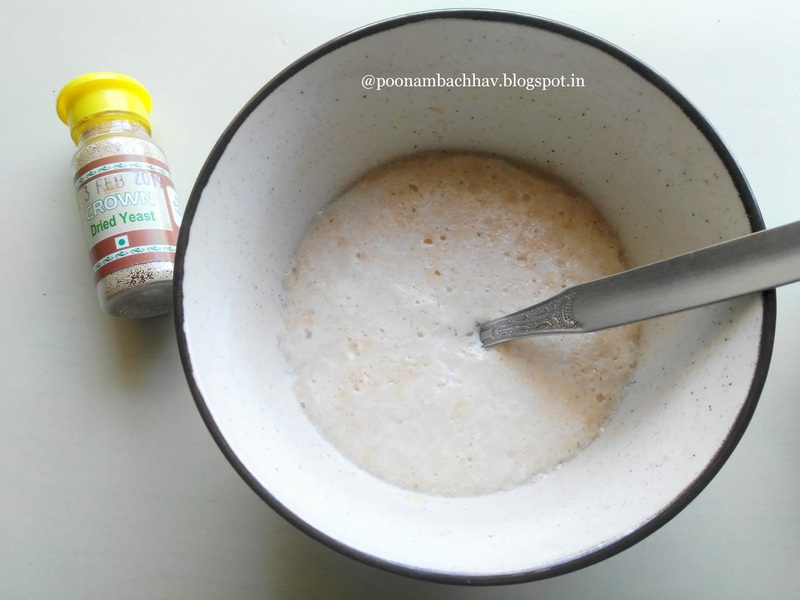 very detailed and nicely explained recipe.Switching to whole wheat flour from apf is a good and nutritious choice!! This is super cool Poonam. I want to bake these once the winter is here as I am sure my family will love this in the boxes. Perfect Poonam! You have made a superb combo of my two favorite hometown (Mysore) bakery specials, khara bun and open faced cabbage sandwich! Love it! I have always wanted to make this!